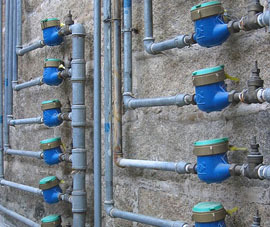 Water Meter Reading is an essential step building owners must take to accurately determine the amount of water a tenant has used, and assign its proper cost. In addition to ensuring landlords an accurate reading of tenants’ actual water usage, professional meter readers are trained to inspect for leaks and other potential safety issues. The pros at AquaAudit provide a full range of water meter reading services, providing monthly or quarterly bills that are easy to read and understand, as well as itemized bills for you to pass on to each of your tenants. If you don’t know how to match all your meters with tenants, you’re probably losing money. We can arrange for a simple water-line trace to match each meter to its corresponding tenant. Once this is accomplished, you’ll be able to recoup lost revenue and begin charging the appropriate user. When a water meter wears out or malfunctions it does not register the water passing through it. As a consequence, the landlord pays for the tenant’s water or else has to estimate usage. This can result in the loss of thousands of dollars over time. AquaAudit’s meter reading division can check your property for non-registering meters and recommend corrective action if any are found. Most older buildings have an underground steam-return. Because it is underground, any leakage from steam-returns would be undetectable — until you receive your water bill! Underground steam-return leaks can result in millions of gallons of water being wasted. The solution is to have a water meter installed on the cold-water feed to the boiler. The meter would pick up any sudden or abnormal “spike” in water usage and alert you to the problem before it becomes a truly major expense.